The dynamics of a positively buoyant release in a cross-flow within a rectangular channel are investigated. In particularly, we focus on the effects that determine the so-called ‘critical ventilation velocity’ that prevents the development of any back-layer flow upstream the buoyant source. 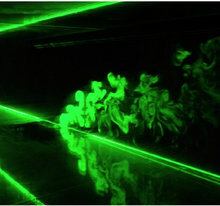 To that purpose, we firstly identify the non-dimensional parameters that govern the flow dynamics within the tunnel. We then perform a parametric study by means of laboratory experiments, in order to draw the dependence of the non-dimensional critical velocity on these governing parameters. The results show that, in the range of values of the parameters investigated, the flow is mainly sensitive to only one parameter, the plume Richardson number, that expresses the balance between momentum and buoyancy at the source. In particular, it is remarkable that the non-dimensional critical velocity does not exhibit any significant dependence on the ratio of the ambient and the buoyant fluid densities, a parameter whose variations are usually related to the rising of non-Boussinesq effects. This has important implications in the simulation of these flows both by simple analytical models and by more complex CFD codes. The dynamical behaviour identified in the experiments provides also a reliable interpretation for the dependence of the critical velocity on the heat release rate of large fires observed by previous authors, both in laboratory and in situ experiments.